Introduction: Named in honor of Lt. Col. Hiram Anderson, Fort Anderson (aka Deep Gully) was a Union constructed earthwork on the north bank of the Neuse River directly opposite New Bern. Fort Anderson, located in Craven County, North Carolina, was a relatively small earthen fort that enjoyed strong natural defenses. It was flanked on both sides by swamps and was approachable only in front along a narrow causeway. 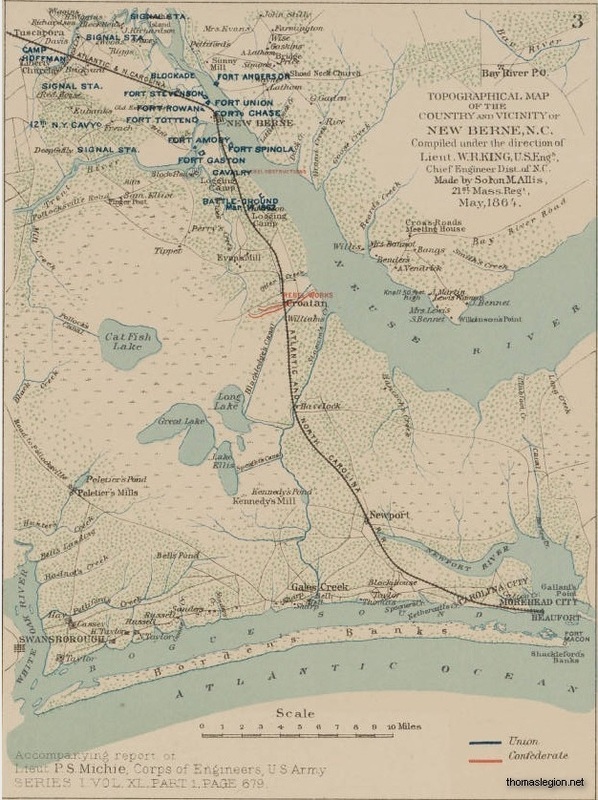 Fort Anderson, or Deep Gully, should not be confused with Confederate Fort Anderson, which protected Wilmington, located on the Cape Fear River to the south in New Hanover County. See also Fort Anderson on the Neuse, Potsdam [New York] Courier Freeman, March 9, 1864. (Right) Map with location of forts on the North Carolina coast during the Civil War as well as present-day military bases. Summary: Lt. Gen. James Longstreet assumed command of the Department of Virginia and North Carolina on February 25 and initiated his Tidewater Operations. He directed D. H. Hill, commander of the North Carolina District, to advance on the Union stronghold of New Bern (spelled New Berne at the time) with about 12,000 men. Maj. Gen. William H. T. Whiting, who commanded the Wilmington garrison, refused to cooperate. After an initial success at Deep Gully on March 13, Hill marched against the well-entrenched Federals at Fort Anderson on March 14-15. Hill was forced to retire upon the arrival of Union gunboats. 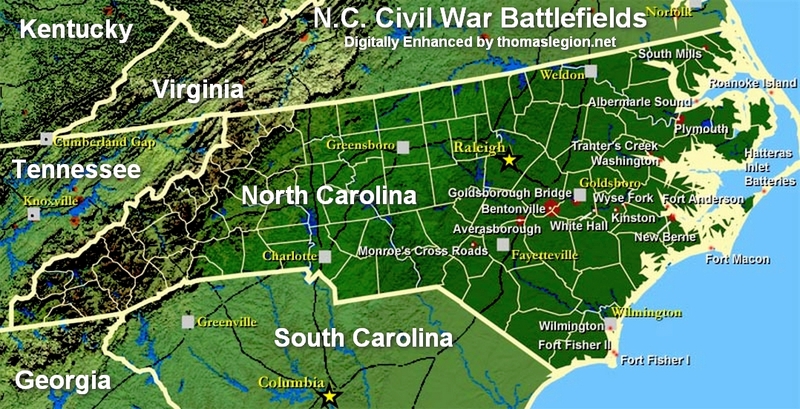 The city’s garrison was heavily reinforced, and Hill withdrew to threaten Washington, North Carolina. Fort Anderson was a strategic objective in the Union Anaconda Plan. History: After a Confederate victory at Fredericksburg, Lt. Gen. James Longstreet was given the assignment to gather supplies and maintain supply lines for the North Carolina area. Longstreet assumed control of the 45,000 men in the North Carolina and Virginia companies on February 25, 1863, and ordered Lt. Gen. D.H. Hill, commander of the North Carolina district, and his 12,000 men from the North Carolina division, to regain control of New Bern. D.H. Hill devised a three-pronged plan to take control of New Bern. Marching from Kinston, Brig. Gen. Junius Daniel would attack New Bern from lower Trent Road as Brig. Gen. Beverly H. Robertson led the cavalry to New Bern by Upper Trent Road. Brig. Gen. James J. Pettigrew’s brigade and Major John C. Haskell’s artillery forces were to attack the Federal Fort Anderson and gunboats from Barrington’s Ferry. On March 13, 1863, Confederate forces met the Federals eight miles outside of New Bern and pushed them back to Deep Gully. Fighting ensued at Deep Gully and the Federals retreated to Fort Anderson. At daybreak the following day, Pettigrew unleashed steady and rapid fire on the Federal earthworks. Pettigrew feared that an attempt to take the Fort would cost him between 50 to 100 men, so he planned to bombard the Fort and then request U.S. Lieutenant Colonel Hiram Anderson’s surrender. After a fusillade lasting a few minutes, Pettigrew sent his aide, Lieutenant Louis G. Young, to request the fort’s surrender, but Lt. Col. Anderson refused. Instead Anderson requested a ceasefire so that he could allegedly discuss the surrender with General Foster in New Bern. Despite a warning from his lieutenant, Gen. Pettigrew accepted the ceasefire. Lt. Col. Anderson used the ceasefire to allow Union gunboats time to assume a firing position. Once Anderson’s plan became apparent to Gen. Pettigrew, Confederate forces were ordered to resume “rapid and terrific fire.” Pettigrew maintained his position attacking the fort until Federal gunboats appeared and forced a retreat. After Pettigrew’s withdraw, Hill was forced to remove his troops from New Bern and head to Washington, NC. The mission was not a complete failure because D.H. Hill was able to fill wagons with food supplies for the troops from areas that were not guarded by Union forces. It is estimated that there were seven casualties at Deep Gully and Union Fort Anderson. Sources: National Park Service; Official Records of the Union and Confederate Armies; North Carolina History Project.